FULL BEARD NATURAL UNDER 2"
FULL BEARD NATURAL OVER 12"
The next in a series of legendary facial hair competitions, the RVA Beard League invites you to join us April 25th at the Canal Club in Richmond for the Mid-Atlantic Beard & ‘Stache Championships IV presented by The Mod Cabin, where 100% of the proceeds will benefit the Paralyzed Veterans of America Mid-Atlantic Chapter! Tickets are $15 in advance and $20 at the door, with no extra fee to compete in any of our 14 categories. Doors open & on-site registration starts at 4 PM, and the Championships starts promptly at 6 PM. Frequent updates for the event will be made on the Mid-Atlantic Championships' Facebook Event page. Be sure to click that you're going, then share it and tell your friends! We have four main events planned throughout the weekend for local folks and those traveling from out-of-town to enjoy. With the obvious exception of the Championships (at $15/$20), all are free to attend. Friday, April 24 at 9:00 p.m.
Sunday, April 26 at 11:00 a.m. In 2013, GameGuy and the Virginia Lottery stopped by. Check out the awesome 30 second spot and see just a hint of what you can expect at this year’s Championships! The Mid-Atlantic Chapter of Paralyzed Veterans of America was founded by a band of service members who came home from World War II with a spinal cord injury. They returned to a grateful nation, but also to a world with few solutions to the challenges they faced. They made a decision not just to live, but to live with dignity as contributors to society. They created Paralyzed Veterans of America, an organization dedicated to veterans’ service, medical research and civil rights for people with disabilities. Located in Chesterfield County, Virginia, the Paralyzed Veterans of America, Mid-Atlantic Chapter was officially formed in 1947 and is one of the 13 original co-founding chapters of the organization. With nearly a thousand members, the work continues today to create an America where all veterans and people with disabilities, and their families, have everything they need to live full and productive lives. 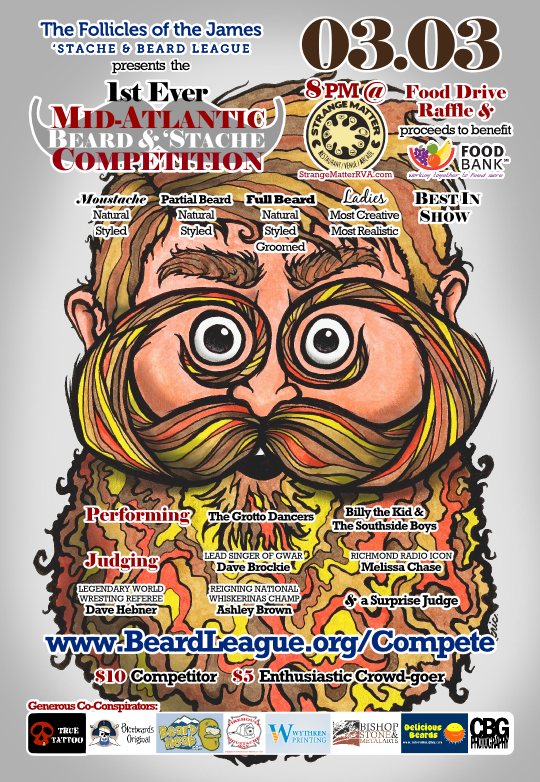 The RVA Beard League is here to put a new face to the outdated negative stereotypes associated with facial hair. As we travel around the U.S. supporting other clubs at charity facial hair competitions, we serve as RVAmbassadors, representing the best of Richmond and Virginia. Back home in Richmond we improve our hometown through the 3 C’s of community service, charitable fundraising, and camaraderie.